A group of ghosts haunt the Freeling family and abduct their youngest daughter, Carol Anne, in the original, Tobe Hooper-directed (maybe) Poltergeist. The movie has scared audiences for over 30 years, and has remained popular to this day thanks to a 2015 reboot and continued discussion over the 1982 movie’s controversial production and alleged curse. Here are some facts about the original, before you get directions to hell. 1. STEPHEN KING WAS INITIALLY ASKED TO WRITE THE SCRIPT. Steven Spielberg wrote an 11-page treatment in 1980 titled Night Time, and wanted the emerging face of horror to write the script off of his idea. King and Spielberg had a pleasant lunch, but King’s publisher allegedly asked for too much money. 2. THE FREELINGS’ NEIGHBORHOOD WAS BASED ON SPIELBERG’S OWN. 3. IT’S SIMILAR TO AN EPISODE OF THE TWILIGHT ZONE. Richard Matheson wrote the Twilight Zone episode “Little Girl Lost,” which was about a little girl who goes into another dimension through her bedroom wall. Matheson has said Poltergeist was inspired by the episode, but he never received any credit for it. 4. 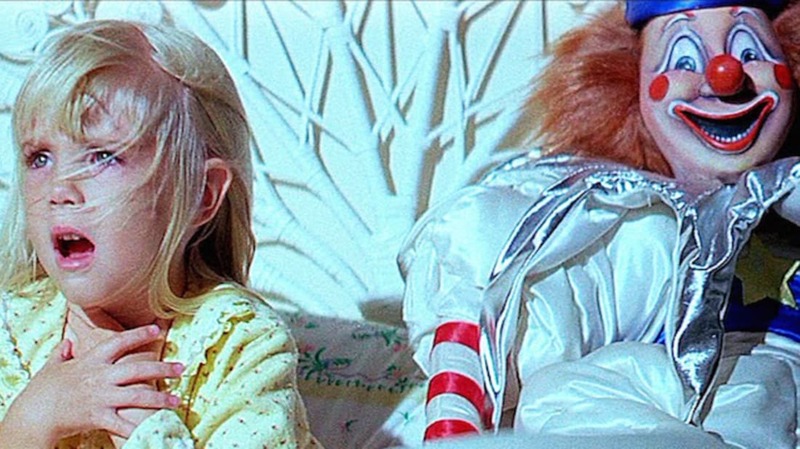 DREW BARRYMORE AUDITIONED TO PLAY CAROL ANNE. Spielberg thought she would be better suited for E.T., which happened to come out one week after Poltergeist. 5. THE ACTOR WHO PLAYED MARTY HAD QUIT ACTING TO BECOME A TEACHER. Martin Casella had quit acting to become a teacher, but auditioned to play the paranormal investigator Marty anyway. Spielberg, who was acquainted with Casella from previous movies, liked to pretend Casella was a valet and would always toss him his car keys whenever he saw him. When Casella won the part in Poltergeist, he was informed by Spielberg—moments after catching his keys. 6. STEVEN SPIELBERG WAS A HANDS-ON PRODUCER. LITERALLY. In the scene where Marty ripped off his own face, Spielberg ripped off the lifelike bust. Casella insisted that Spielberg do it because they only had the one bust and he was worried he would make a mistake and ruin the shot. 7. THE CHAIR-STACKING SCENE WAS DONE IN ONE TAKE. When Diane (JoBeth Williams) turned away from the table, crew members quickly replaced the kitchen chairs with an already-assembled cluster of chairs. 8. THE TREE SCENE WAS SHOT BACKWARDS. Robbie (Oliver Robins) was actually spit out, not swallowed up, by the tree. Reversing the shot made the final result look much better. 9. THE IDEA FOR THE TREE GRABBING ROBBIE CAME FROM A CHILDHOOD MEMORY. Michael Grais ended up co-writing the screenplay with Spielberg and Mark Victor. His inspiration for the tree scene came from a memory of being home alone one stormy night, sitting on the stairs on the second floor of his family home. When lightning struck the tree in his yard, a big branch crashed through the window right near him. 10. TANGINA ONLY WORKED FOR SIX DAYS. Zelda Rubinstein was screen-tested four times before she landed the role of Tangina, the medium. She admitted the role changed her life, even though she was only on set for six days of the 12-week shoot. After filming, Rubinstein didn't hear a word from anyone involved with the movie for a year, leading her to think it might never see the light of day. 11. TOBE HOOPER ATE SPICY FOODS ON SET. Tobe Hooper, who also directed The Texas Chainsaw Massacre, ate jalapeño peppers to help him power through the long shooting days. He also enjoyed Indian curries when he had the time. 12. THE HOLIDAY INN PROMOTED A PRODUCER’S MAGIC ACT. The Holiday Inn sign welcomed “Dr. Fantasy & Friends.” Producer Frank Marshall’s stage name is Dr. Fantasy. Marshall does a little magic show at the end of every movie’s production. 13. THE IMPLODING HOUSE WAS A SIX-FOOT-WIDE MODEL. It took four months to create. Thick wires were attached inside of the model and pulled into a funnel, with the model placed over the funnel and the camera shooting downward. If something went awry, the model would have melted or burst into flames. 14. THERE'S STILL CONFUSION OVER WHETHER SPIELBERG ACTUALLY DIRECTED THE MOVIE OR NOT. Spielberg was not allowed to direct both Poltergeist and E.T., but he was on the Poltergeist set often, leading many to speculate that he was secretly directing the movie himself. “I've been asked that so many times that I feel the record should be straight already,” Hooper told The A.V. Club. “The genesis of it came from an article in the L.A. Times: When we were shooting the practical location on the house, the first two weeks of filming were exterior, so I had second-unit shots that had to be picked up in the front of the house. I was in the back of the house shooting Robbie [actor Oliver Robins] and the tree, looking down at the burial of the little tweety bird, so Steven was picking those shots up for me. The L.A. Times arrived on the set and printed something like, ‘We don't know who's directing the picture.’ The moment they got there, Steven was shooting the shot of the little race cars, and from there the damn thing blossomed on its own and started becoming its own legend. Really, that is my knowledge of it, because I was making the movie and then I started hearing all this stuff after it was finished.” Zelda Rubinstein said Spielberg was the director during her six days. 15. SPIELBERG LOBBIED FOR A PG RATING. 16. SOME BELIEVE THE MOVIE MIGHT BE CURSED, BECAUSE THE SKELETONS USED WERE ALLEGEDLY REAL. Heather O’Rourke (Carol Anne) died at the age of 12 of cardiac arrest and septic shock stemming from a misdiagnosed intestinal stenosis before Poltergeist III was released. Dominique Dunne (Dana) was murdered by her ex-boyfriend five months after the film's release. Julian Beck, who played Kane in the sequel, died of cancer while shooting the film (he was aware of his condition when he signed up). Will Sampson, who played Taylor in the sequel, died of kidney failure a year after that film's release. All of these deaths have led to a rumor that the production was haunted, on account of the prop master reportedly using actual skeletons.